When I first decided to write a blog, I didn’t realize the amazing commitment that many bloggers make. I have looked at a number of blogs now, and I applaud the real interest, time and love that people seem to put into them. As I was searching about food, I bumped into a number blogs that mentioned Sugar High Fridays (SHF). Being someone who loves desserts, I did some investigation and contacted The Domestic Goddess, who was the blogger that started SHF. She was very helpful in advising me about how I could get involved. I did more research and discovered that this month’s Sugar High Friday #17: Dairy. So, for the past two weeks, I have been thinking about dairy. I recently visited Montréal, where I had some amazing desserts made with yogurt. So, my first idea was to make a dessert with yogurt – something like a parfait. The dessert I made contained caramelized strawberries, dried pineapple, fresh passion fruit, crushed lemon and almond biscotti, and white chocolate and yogurt cremeux. The dessert turned out well, but I felt that it really wasn’t what I wanted to submit for SHF. I went back to the drawing board and thought about making panna cotta. Panna cotta is something that in truth I have never particularly enjoyed; maybe, I just haven’t had “good” panna cotta. So, there it was. Panna cotta was challenging – something that I didn’t like and something that I wanted to make well. After much thinking and not enough doing, I decided that panna cotta might be too obvious and too predictable. Instead, I decided to play around with flavours and to make ice cream. What I wound up with is a trio of ice creams, all infused with tea. The three flavours are earl grey vanilla, green tea kiwi, and peppermint buttermilk. The earl grey vanilla has a pleasant bergamot and vanilla taste that is mild and comforting. The green tea kiwi balances the bitterness of green tea with the sweet and floral note of kiwi. Finally, the peppermint buttermilk is lively, tangy and refreshing. I have always been a fan of ice cream. That is why when I came up with my flavour combinations I looked no further than Claudia Fleming for a good standard ice cream base. 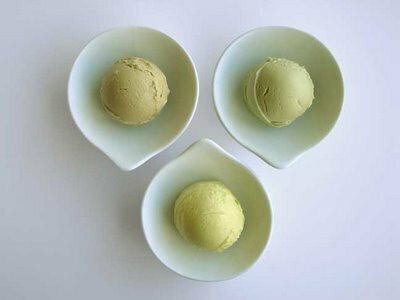 The green tea kiwi ice cream and peppermint tea buttermilk ice cream were favourites among my guests. Heat milk, cream, tea leaves (or bags) and 1 cup of sugar in a heavy saucepan over medium heat and bring to a simmer. Meanwhile whisk egg yolks and remaining 1/4 cup sugar together. Remove the milk and cream mixture from the heat and take out tea bags, if you are using them. Add a small amount of the milk mixture to the egg yolk mixture to temper it. Then pour egg yolk mixture into the milk mixture whisking constantly to keep eggs from curdling. Return to the stove and cook over low-medium heat , stirring with a wooden spoon until it thickens enough to coat the back of the spoon, or until the mixture reaches 185ºF (85ºC). Remove from the heat and strain with a fine chinois. Let it cool completely (and stir in vanilla, if making the earl grey vanilla). Chill custard until it is cold. Freeze in an ice cream maker according to manufacturer’s instructions. Makes approximately 1 quart. Heat cream, tea leaves (or bags) and 1 cup of sugar in a heavy saucepan over medium heat and bring to a simmer. Meanwhile whisk egg yolks and remaining 1/4 cup sugar together. Remove the cream mixture from the heat and take out tea bags, if you are using them. Add a small amount of the cream mixture to the egg yolk mixture to temper it. Then pour egg yolk mixture into the cream mixture whisking constantly to keep eggs from curdling. Return to the stove and cook over low-medium heat , stirring with a wooden spoon until it thickens enough to coat the back of the spoon, or until the reaches 185ºF (85ºC). Remove from the heat and strain with a fine chinois. Let it cool completely and stir in buttermilk. Chill custard until it is cold. Freeze in an ice cream maker according to manufacturer’s instructions. Makes approximately 1 quart. Posted by Sam at 2:34 p.m. I found your blog from your comment on Spittoon Extra, and I'm so glad I did! These ice creams look and sound delicious, particularly the Earl Grey Vanilla. Interesting that you debated making panna cotta for SHF #17 and chose to make ice cream instead. I thought about making ice cream and decided instead on panna cotta. Hee! I can't wait to see and hear about your panna cotta! I feel guilty for not making panna cotta, but I am glad that you are doing it, somebody has to represent! I am however, going to try to make it this weekend, with hopes that I can do it justice. Hola! I also found your blog from the SHF event hosted by Spittoon extra. You ice cream looks delectable. The weather is starting to heat up here in NYC, and now you have me craving ice cream like crazy! I see you experiment with unusual ice cream flavors. When I went to spain I had olive oil ice cream and saffron ice cream. Do you know how to make them? Hi Krys! - Thanks for your comment Krys. I'm always craving ice cream. Speaking of which, where should I go for ice cream when i'm in NYC, any suggestions? Hi Carrie - Olive oil and Saffron sound interesting, gosh I need to go to Spain. I haven't made either before, but I think I'm gonna try out olive oil soon. The ice creams sound intriguing! One of the most popular home improvements where home improvement contractors come in handy are the re styling of your home. If you really wish to give your home a total professional new style then there are lots of interior designers out there who are very willing to help you re furnish and style you house to get the look that you are looking for. However, the problem is that they tend to be quite expensive even though they are really only consultants. As with any other home improvement project, you're the one that will have to pay for all materials and the hours that the contractors spend telling you how to choose fabrics and so on. No matter what type of home improvement project you plan on doing - a large or small job, the home improvement contractors you choose will have a great impact on the results you get for your home improvements. Always make sure that you see their certificates and the materials that they use. Do this both before the job is started and while the project is in progress as well. If you don't like something they are doing you have the decision to stop their work.